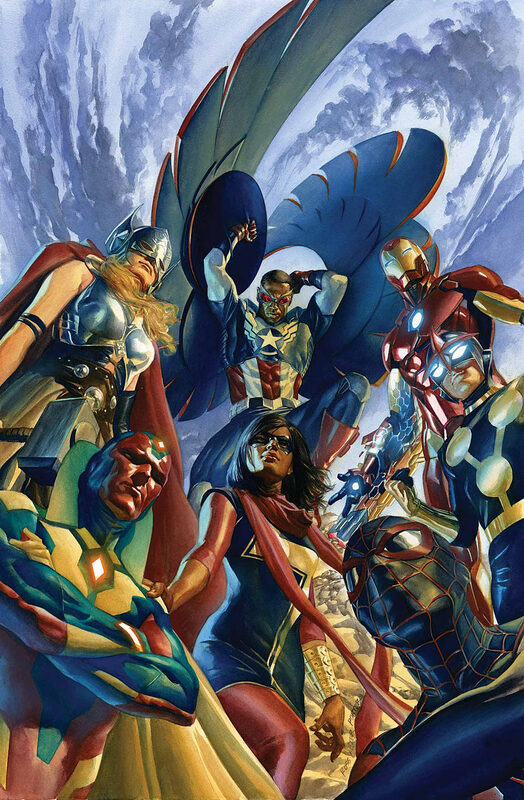 If there’s one thing the Marvel Universe has been missing for quite some time, amidst all the reboots, crossovers and general shenanigans, it’s a coherent version of their premier super-team, The Avengers. It’s probably a good thing then that Mark Waid, Adam Kubert and Mahmud Asrar are on hand to resolve the problem, getting the band back together in emphatic fashion in this brand new series, the first volume of which – dubbed “The Magnificent Seven” – is available now. Be warned though, these aren’t your grandpappy’s Avengers – although there are definitely more than a few similarities to those iconic teams of old. We have an Iron Man, albeit one without any money. Sam Wilson is filling the Captain America role instead of Steve Rogers. Thor is a little more, uh, female than we might be accustomed to. Spider-Man is Miles Morales instead of Peter Parker. In fact, perhaps the only Avenger who still resembles their original incarnation is Vision, and he has his own issues going on here, as we quickly find out. But wait, I hear you cry! Isn’t this political correctness gone mad? Muslims? Black Hispanics and African Americans? WOMEN?!? To those of you thinking this way, I’d like to kindly invite you to click on that little red X at the top corner of your screen and go find something else to do. Or, uh, close your phone. Or tablet. Or however else you might happen to be reading this review. Seriously, there’s nothing for you here. Diverse they may be, but there’s so much more to each and every one of these characters than filling imaginary quotas or appeasing (shudder) “SJWs”. These are fantastic heroes, brilliantly written by one of the best in the business, and – in spite of me never really being much of an Avengers fan in the past – I absolutely loved this volume from the first page to the last. Adam Kubert and Mahmud Asrar make a pretty darn formidable ‘two-headed monster’ with the artwork, bouncing off each other throughout this volume with their similarly bold, vibrant styles. From the typical large-scale destruction of property that tends to accompany books like these to subtle facial expressions betraying true emotions, the art here is – while very much in the Marvel “house style”, assuming such a thing still exists – undoubtedly impressive. Now, it’s not meant as a criticism as such, but the villains in this first volume really do feel like a secondary concern compared to the genesis of this new team and their crackling back-and-forth banter. Perhaps that’s the best way, though. Let the bad guys serve as a unifying force to encourage these diverse characters to “Assemble”, and give them something to work together in order to overcome. Hopefully that niggle can be erased in the future now that the team is established, and Waid can provide us with some of the distinctly ‘out of the box’ style of villainy that made his award-winning Daredevil run such an absolute joy. For all the “Assembling” that goes on here, and all the loud, dynamic action set pieces, it’s the character-based moments that really resonate; Ms. Marvel and Nova’s hilarious “meet cute”; Cap discovering Thor’s real identity; Stark’s ongoing banter with Miles Morales. In spite of the coffee table book splash pages and the usual superheroic posturing, this is essentially a book about people, and with such strong characterisation throughout, it has a firm foundation to build on as the series moves forwards. Fresh yet familiar, “The Magnificent Seven” serves as a fantastic (re)introduction to Marvel’s All-New, All-Different Avengers. This first volume brings together a truly diverse, truly fascinating team and features a perfect blend of comedy and serious drama. I’ve never really been much of an Avengers fan in the past, but this release may have officially converted me. Highly recommended for fans of bold, larger-than life superhero storytelling filled with humour, action and heart. You can purchase All-New All-Different Avengers vol. 1: The Magnificent Seven from Turnaround Publisher Services (who generously provided the review copy of this title) via their official website. I’m so excited for this volume and I can’t wait to read it (though I still have some catching-up to do on previous avengers titles). As you said, they’re great characters and stunning art-work. Great review!